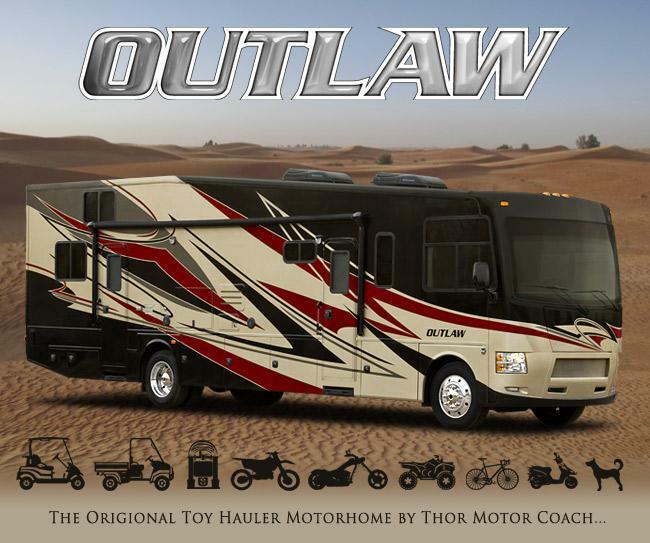 Thor’s take on the all new 2015 Outlaw Toy Hauler gives you endless possibilities! 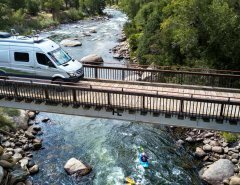 This Outlaw is a toy hauler motorhome, a motorhome with a garage, the perfect motocross companion, perhaps a mobile home-office on the road. 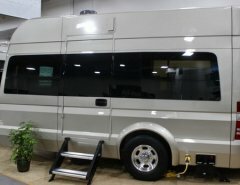 Or, it’s a family motorhome with nothing else to haul but the family, sleeping 6-8. 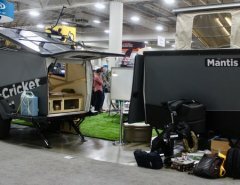 And that’s why Thor transformed the Outlaw to be a modern residential motorhome as well still being a super classy toy hauler. The new 39-foot, Model 38RE has a Spacious Living area, Drop Down Ramp Door w/ Spring Assist/Railing for Patio use, AM/FM Radio w/In Dash CD Player & Back Up Monitor, Remote Exterior Mirrors w/Side View Cameras, Electric Windshield Roller Shade, Generator Start Switch On Dash, Reclining/Swiveling Leatherette Captains Chair, Leatherette Sofa/Air Bed driver side, Leatherette Euro Recliner, Booth Dinette, 18 Cu Ft Residential Fridge, 3-Burner high output Range w/Oven, 30″ OTR Microwave, 12V Attic Fan in kitchen, solid surface kitchen countertop, 40″ TV in Living area, 32″ Exterior TV & Bedroom TV, DVD Player, HDMI Video Distribution, Bluetooth Enabled Coach Radio System w/Exterior Speakers, to name a few standard features and amenities. The Outlaw has 3 models for 2015: the 37LS, 37MD, and 38RE.